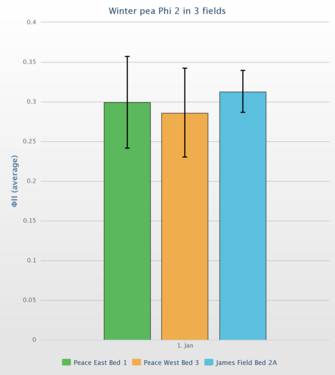 An important potential use of the new PhotosynQ MultispeQ is for farmers to measure photosynthesis on crop plants and base management decisions on the results. We did a couple of mini studies at iFARM to demonstrate this potential. Dorn planted a new cover crop mix last fall with winter rye and Austrian winter pea. We measured some aspects of photosynthesis on individual Austrian winter pea leaves in three different fields with different densities of rye and pea. I am holding the MultispeQ with a single leaflet of Austrian winter pea in the measurement chamber and with my hands shielding the opening from the sun. Upper or leftmost: Chlorophyll content of Austrian winter pea leaflets in three fields. Lower or rightmost: Photosynthetic efficiency (Phi2) of Austrian winter pea leaflets in three fields. 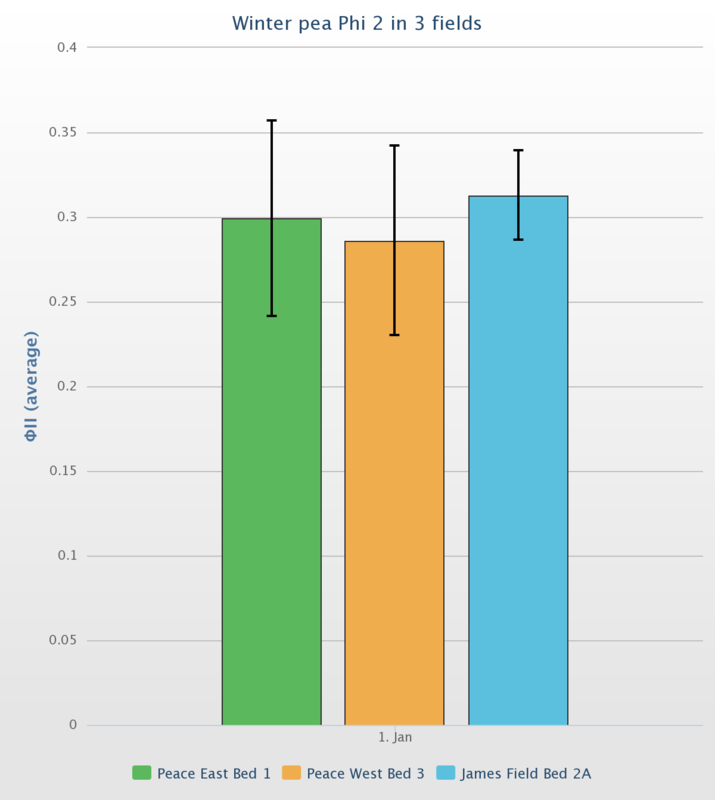 Each bar is the mean of nine measurements (3 leaflets on each of 3 plants). The error bars are probably +/- 1 standard error. It took less than 15 minutes to make the measurements in each field. 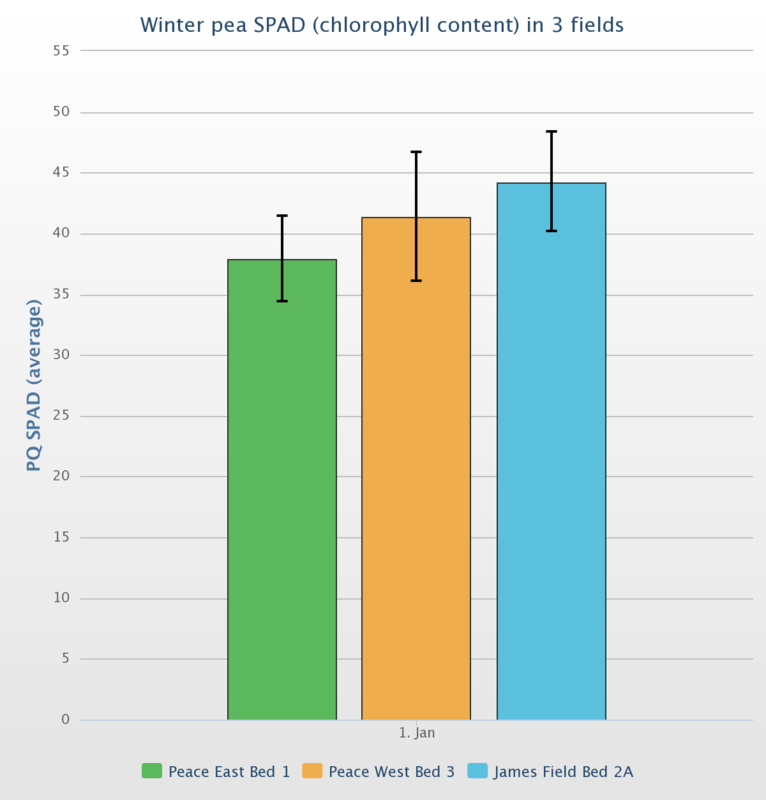 As expected, there is not much difference among fields in winter pea photosynthesis. All of the pea plants looked very healthy. The case of the wilty red clover. A patch of stressed hay field surrounded by healthy vegetation where some new soil had been delivered earlier. We also focused our photosynthesis sleuthing on a mysterious patch of wilting hay field. 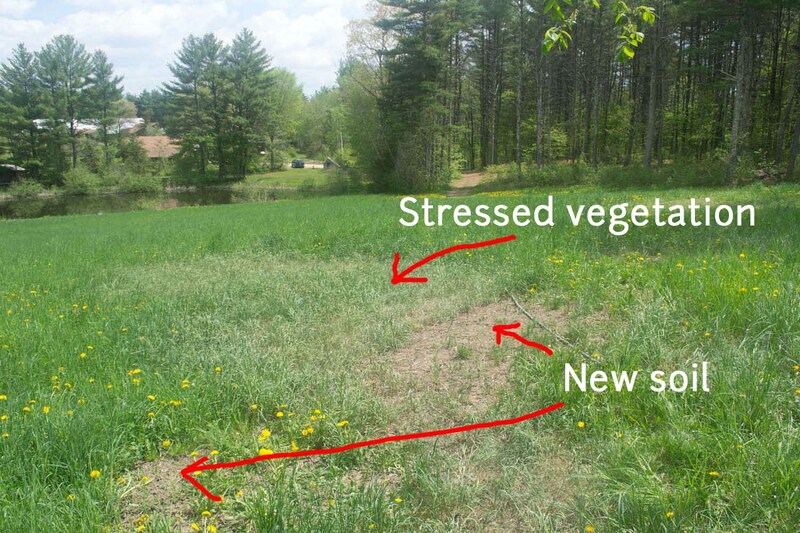 We took measurements on individual leaflets of red clover inside of and surrounding the patch of stressed vegetation. Closeup view of the boundary between stressed and healthy hay field. Upper: RGB photo. 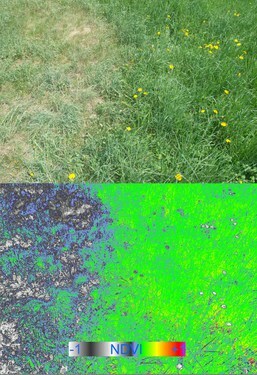 Lower: NDVI image from Wratten 25A infrared plant health camera. 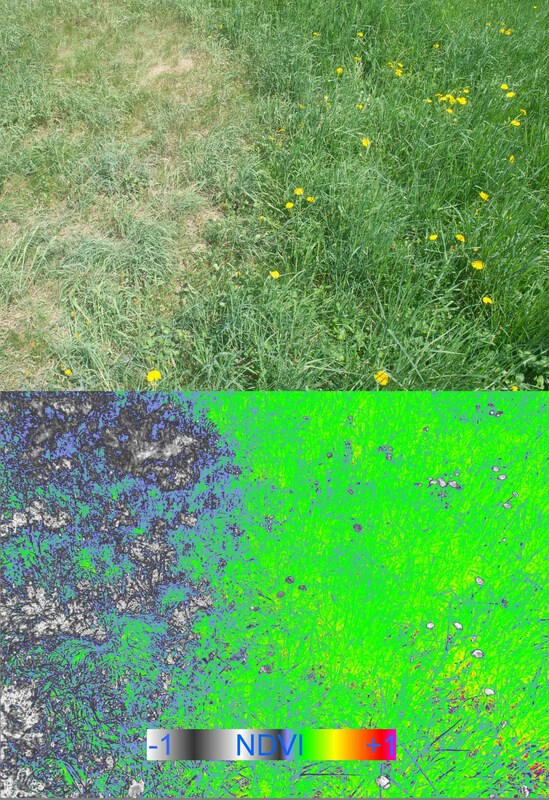 Normal photos and NDVI images suggest that there is a dramatic difference in plant health between the grayish patch and the surrounding green hay field. We collected MultispeQ measurements on nine leaflets of red clover (Trifolium pratense) inside and outside the stressed patch. The first set of measurements was confusing, so we repeated the sampling. The second data set made a little more sense and revealed an interesting phenomenon. 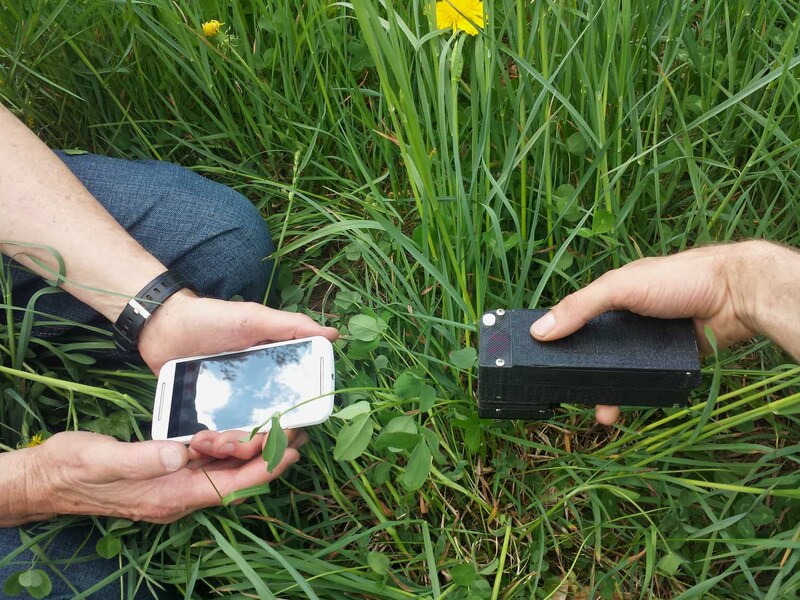 MultispeQ field measurements go much faster if one person drives the Android app on a mobile device (left) and another clamps the leaf into the MultispeQ chamber (right). Photosynthetic efficiency (Phi2) of red clover leaflets differed between plants inside and outside the stressed patch of hay field. There was much more variability within the stressed patch. As we were collecting measurements, we remarked that the sun had been behind a cloud for all of the samples of clover in the healthy vegetation, but when we started to measure the first stressed plant, the sun came out strongly. After four measurements of stressed clover leaflets, a cloud moved in front of the sun again. Light intensity (PAR) during each measurement and time of measurement of clover leaflets in healthy (green dots) and stressed (orange dots) hay field. The sun was shining brightly only for four measurements in the stressed vegetation. 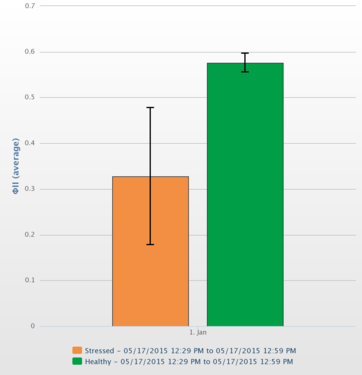 Photosynthetic efficiency (Phi2) and time of measurement for nine healthy (green dots) and 10 stressed (orange dots) red clover leaflets. The lowest photosynthetic efficiency measurements are the four measurements taken when the sun was shining. The changing sunlight seemed to add a variable that makes it difficult to conclude much about the relative photosynthetic health of these clover plants. 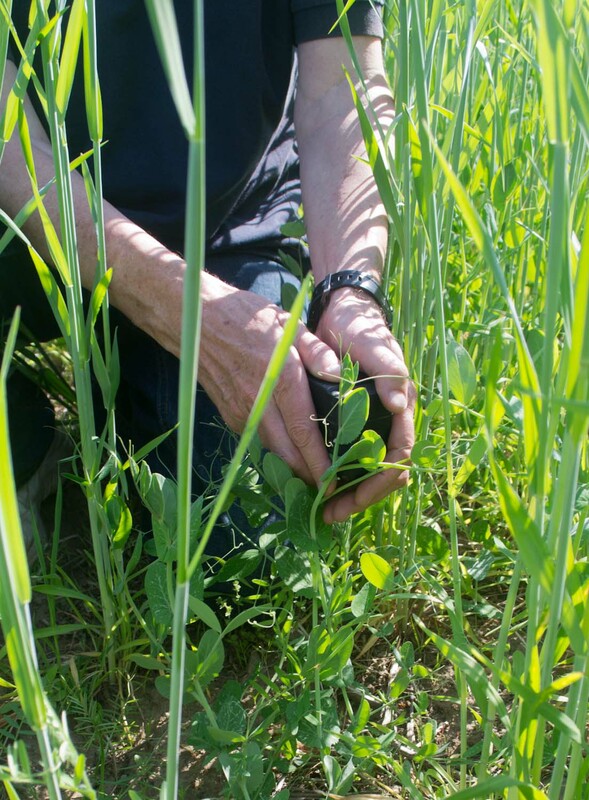 For the measurements taken when the sun was behind a cloud, there is not very much difference between stressed and healthy clover plants, although that small difference could be important. A different sampling strategy and bigger sample sizes would have helped reveal the underlying pattern. Maybe some of the other measurements made by the MultispeQ (chlorophyll content, non-photochemical quenching, linear electron flow, proton motive force) could help solve the case. I need to learn more about what each of these measurements tells us about plant health. It would also be good to know which ones are more sensitive to changing ambient light conditions. I assume the wilting clover are drought stressed (probably due to thin soil over bedrock and lack of rain). Which MultispeQ measurements tell us the most about drought stress? There is much to learn. Thanks to Mike, Dorn, and Ned for field assistance and photos. Nice! Yes, light intensity and phi2 are linked at the hip, and changes in light intensity will produced changes in phi2 on the millisecond timescale. Also useful to know that Linear Electron Flow (LEF) = Phi2 * light_intensity * .4 . The .4 is an assumption about the amount of light which is not absorbed into the leaf + the amount absorbed by photosystem I. You can see that phi2 (efficiency) drops off at high light intensity. Your cloud data is a perfect example of this effect. 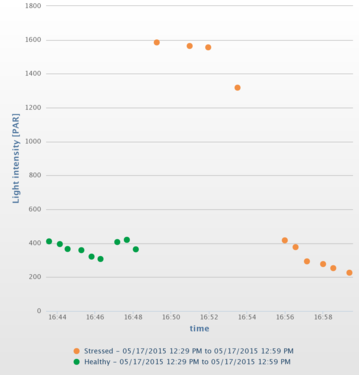 The typical way to address this is to collect a wide range of light intensities on the same plant over the course the day. 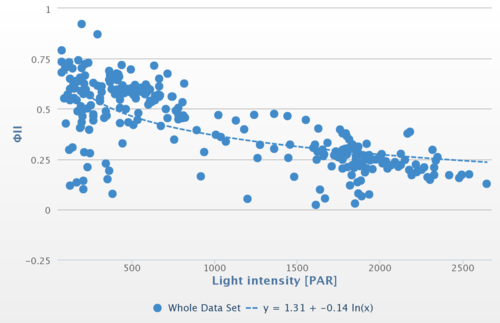 In other words, instead of trying to compare everything at exactly the same light intensity (which is near impossible outside), we try to create the entire curve seen above for each sample. This requires lots of measurements over many light intensities for the same sample population. A great example of this is Jared's wheat project in Mexico - he took replicates of the same plot throughout the day, and ended up with a nice distribution of light intensities for each of his samples. Here's a link to that data. I'm confused by the goal of the experiment. Would just measuring Fv/Fm / or related values on a dark adapted leave not be quicker and more accurate in this case if you are after quantifying differences in maximum photosynthetic capacity. Well... if you're working on maximum photosynthetic capacity. But that's not necessarily the same thing as actual capacity during the day (phi2). My understanding (which is limited so feel free to argue here) is that fv/fm will show long term effects like photo-damage, but there are many possible reasons besides photo-damage which could produce changes in actual photosynthetic efficiency and biomass accumulation. 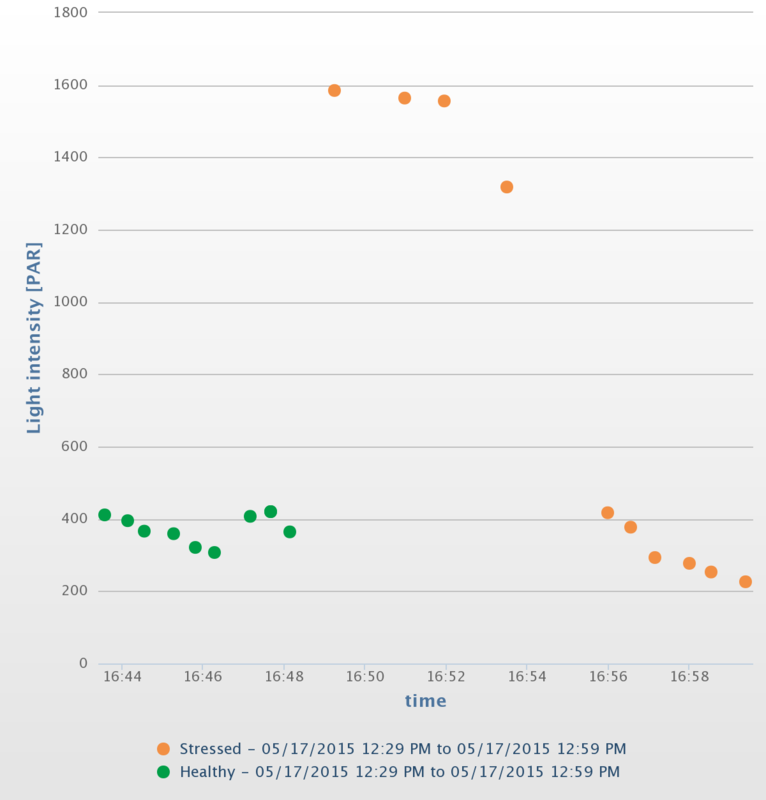 It is an interesting question though - do you see the same differences if you collect fv/fm at night? As far as I understood is the value light use efficiency value (LUE / phi2) you measure by using PAM fluorescence (LUEpam) conceptually the same as measuring Fv/Fm but with a variable baseline (Fo floats, and is a function of your photon flux density or light intensity and a fudge factor). 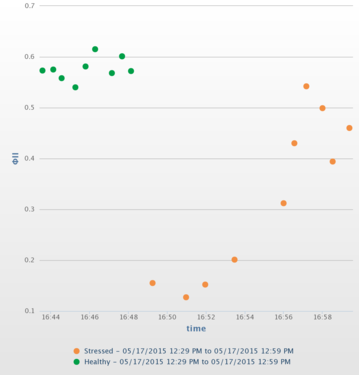 Measuring your light use efficiency does allow you to track diurnal patterns across the day which directly links to productivity. I see these measurements as rather specific physiological measurements and rather hard to implement in open ended situations (e.g. not controlled experiments or farm conditions with management regimes). Ideally a true test would be using controlled plants where you fertilize one patch, and not the other or similar. I guess it's the point you made with the curve. Now trying to squeeze this all into one session and adjusting for PPFD will only add more noise and not tell you anything more than Fv/Fm values I feel. But that's my opinion. I've done my share of field sampling and going out to collect as many points as possible when a simpler method exists which will tell you just the same is something you come to value. @gbathree, this wasn't as much a critique on the technique, but personal experience has taught me that you have to be really picky on how you allocate time if you do field measurements. 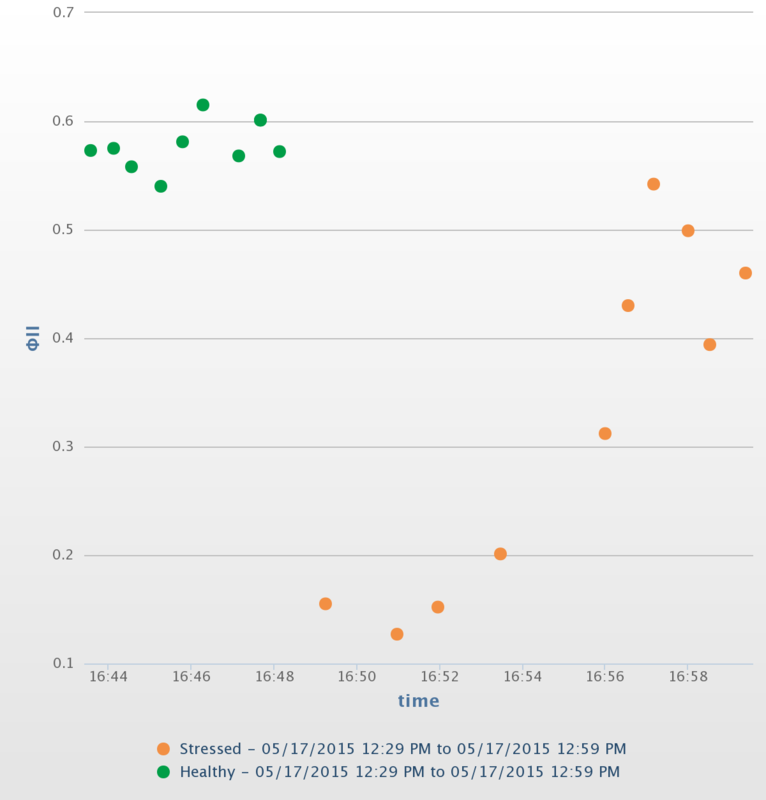 It would be really interesting if you could do continuous monitoring throughout the season using the MultispeQ, logging data of say 4 probes on a plant on a regular interval automatically (instead of doing this manually). No worries - this is an important discussion and you're right, it's not at all easy to measure. We've spent a lot of time helping people (mostly breeders, some ag extension folks) design experiments correctly to address the very issues you identified. But it's also hard to measure fv/fm - you can use leaf clamps during the day and dark adapt each leaf for 15 minutes at least (which affects the leaf due to clamping and even 15 minutes often isn't even for full dark adaptation) or you can measure the leaves at night (which is sometimes hard to convince people to do). I'm hoping that one of our collaborators here in Eric Olsen's lab actually do get both Phi2 during the day, and go out to collect fv/fm at night. To be honest, I'm not sure if there's a big difference between the two or not. I'm going to email another friend to respond here. He's done a bit more searching in the literature about fv/fm versus phi2, and the differences or similarities in terms of outcomes. We have another protocol in the works which may be able to estimate a more complete portion of the light / phi2 curve without producing lots of measurements throughout the day. This would significantly improve our statistical power per time spent measuring (that's the most important measurement, after all!) I'm really excited about that if we can get it to work, but it's still very much in the testing stages. Ah, my apologies for getting to this conversation late. I should qualify what I'm about to say by stating that I'm no expert in chlorophyll fluorescence, either theoretically or practically, and that most of my experience comes from controlled studies of plants raised in growth chambers. I originally started taking chlorophyll fluorescence measurements on dark-adapted leaves (taking measurements very early in the morning just before the lights were scheduling to come on), measuring Fv/Fm. Even in pretty severe drought stress treatments, we didn't see a statistically significant difference between the stress treatments and controls for Fv/Fm values. Only when damage could be readily detected visually did the Fv/Fm values tick downwards.I looked at a few other studies, and noticed that some of them also had no luck in finding Fv/Fm differences in their various treatments (perhaps it is species or treatment dependent). At least going by the gas exchange evidence of Photosynthetic rates vs. intercellular CO2 concentrations, the actual biochemistry of photosynthesis is very resilient to stress in the sense that it doesn't accrue permanent damage easily. So, it makes sense that Fv/Fm, measuring maximal rates under ideal light conditions, would be a fairly stable, unchanging parameter. Perhaps measuring on 15-20 minute dark-adapted leaves allows a capture of mid-term photoinhibition damage that isn't seen when I dark-adapt leaves for 8+ hours. So, I switched to phi2 measurements if only because they could give me fairly consistent differences based on treatment as long as I designed my measuring protocol well. Admittedly, in field conditions, it is a bit more difficult to achieve that same level of control in measuring conditions, and perhaps Fv/Fm shows more variability-based on treatment in field conditions as well. I'd be interested to see how these clover patches respond if the experimenters went back and took Fv/Fm measurements on them during three or four points during the night.